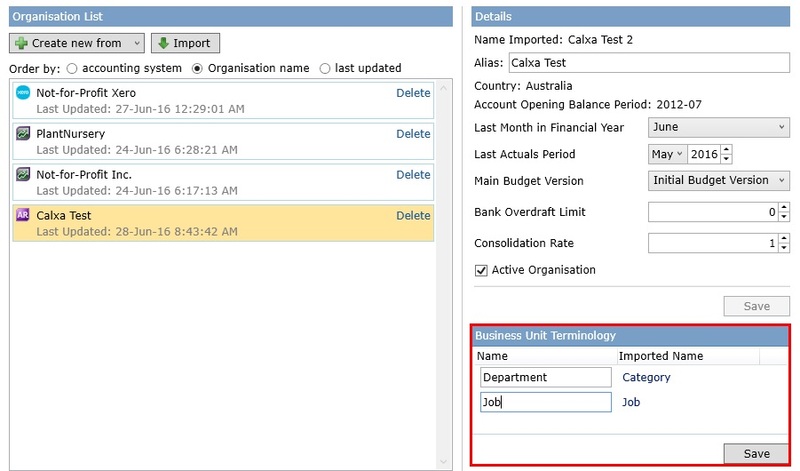 This help note will show you how to connect to your AccountRight data, perform subsequent organisation updates and also briefly discuss Calxa business unit terminology. This desktop integration type supports MYOB AccountRight 2013.3 or higher using Local, Network or Online Libraries. With versions 2014.1 or higher MYOB provide two installation editions, the PC Edition and the Server Edition. The Server edition requires a separate install of the API, so if you are using the Server Edition (SE) of MYOB, you may need to install the API if it wasn’t done when your AccountRight Live was installed or updated. The Install AccountRight API help note provides instructions. The PC Edition does not require separate installation of the API as the PC edition runs an Add-On Connector in place of the API. The add-on connector is automatically installed with the PC edition. Note: MYOB AccountRight Local and Network libraries files are not supported for use with a Calxa online workspace. You must use an online accounting file with an online workspace. Click on the Organisation Management button. 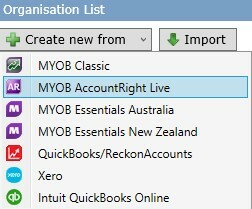 Click on the Create new from drop down button and select MYOB AccountRight Live. Select Local Libraries to access local or network libraries or select Online Libraries for MYOB online files. 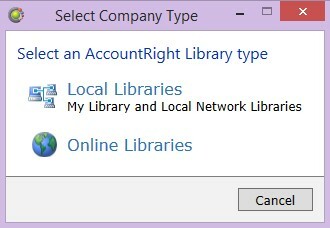 Local Libraries: Select My Library for company files saved in My Library or Network Libraries to access company files saved on other computers. My Library: Your local MYOB library will be displayed. Network Libraries: Enter the computer name or IP address of the machine that hosts your MYOB library and click the right facing arrow to connect. The library on that computer will then be displayed. Click the Select button next to the company file you wish to connect to. By default MYOB sample files are not displayed. Deselect Hide sample files if you wish to use them. Note: If your company file is listed in the unsupported versions list you will need to first upgrade the company file by opening it in MYOB AccountRight Live. Online Libraries: You will be asked to select an authorisation type, either long term or one time. Long Term Access Token is the recommended selection as you will only need to authorise once, providing long term access using an access token that is securely stored on Calxa’s authorisation server. A One Time Access Token will prompt you to authorise each time you perform an update. Note: This option only applies to users signed in to a Calxa Online Workspace. Local and network workspace will use the One Time Access Token by default. Select the desired Authorisation type. Next sign in with your my.MYOB credentials. Your MYOB online library will be displayed. Click on your my.myob id on the left. Next click Select next to the company you wish to connect to. 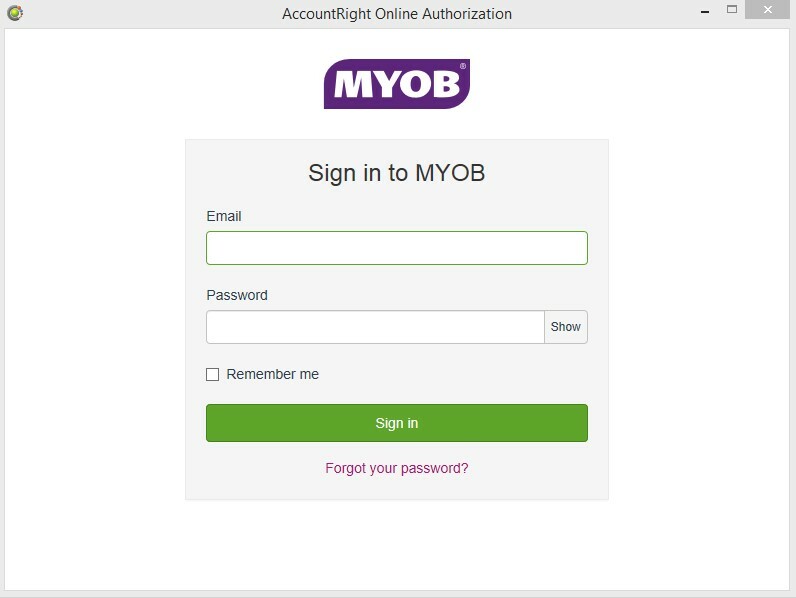 Enter your MYOB file user credentials and click Login. Note: You may optionally choose to save the MYOB file credentials to avoid providing them in the future. Calxa will then run through the process of importing your MYOB company data. Once completed the company will then be displayed in the Organisation List. Calxa broadly refers to cost centres as Business Units (including the organisation). On your initial import Calxa associates MYOB Jobs and Categories to the default Calxa Business Unit Terminology of Project and Department. You may manually change the terminology settings to match that of MYOB or some custom configuration however. In the Business Unit Terminology section edit the Name and click Save. 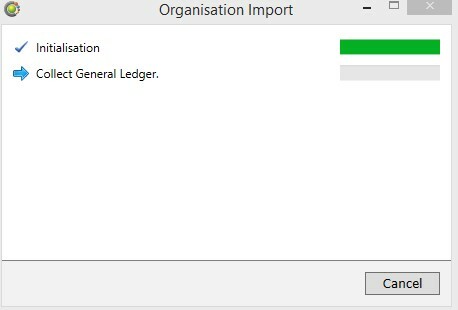 Select the organisation that you want to update from the Organisation List and click on the Update button (online workspace). If you have your data in a local or network workspace you won’t see the Update button, instead you will click on Update with one time access token. 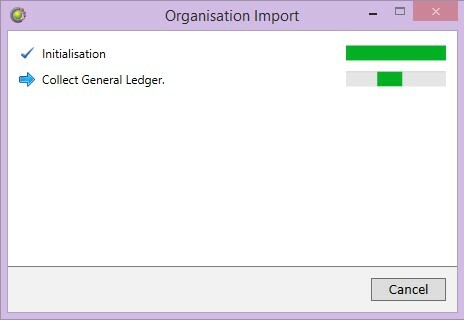 Note: If you have moved your MYOB company file to a new library click Change linked company and choose the appropriate library/company file as described above in the Create Organisation steps. Calxa will then run through the process of updating your MYOB company data in Calxa. 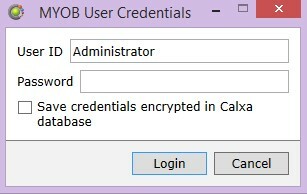 Note: If you have your data in a Calxa local or network workspace you will first be prompted to enter your my.MYOB credentials. 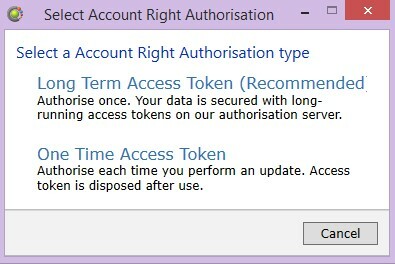 Online workspace users choosing the long term access authentication token will be authorised automatically as shown above. Once completed you will see that the Last updated date and time has now been updated in the Organisation List. To reset the long term authentication token on your online MYOB file follow the steps below. Click on your organisation in the Organisation List. Next click on Change linked company. Now follow the instructions in step 3.2 shown above in Create an Organisation (choose the Online Libraries option). Once completed return to step 4. below. Click the Update button to proceed with updating from Xero.